Elevated CO 2 reduced fine root dynamics (production and turnover) of white birch seedlings, especially grown in volcanic ash soil compared with brown forest soil. Increased atmospheric CO2 usually enhances photosynthetic ability and growth of trees. 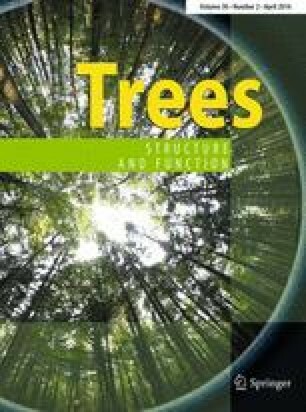 To understand how increased CO2 affects below-ground part of trees under varied soil condition, we investigated the responses of the fine root (diameter <2 mm) dynamics of Japanese white birch (Betula platyphylla var. japonica) which was planted in 2010. The three-year-old birch seedlings were grown in four experimental treatments comprising two levels of CO2, i.e., ambient: 380–390 and elevated: 500 μmol mol−1, in combination with two kinds of soil: brown forest (BF) soil and volcanic ash (VA) soil which has few nutrients. The growth and turnover of fine roots were measured for 3 years (2011–2013) using the Mini-rhizotron. In the first observation year, live fine root length (standing crop) in BF soil was not affected by CO2 treatment, but it was reduced by the elevated CO2 from the second observation year. In VA soil, live fine root length was reduced by elevated CO2 for all 3 years. Fine root turnover tended to decrease under elevated CO2 compared with ambient in both soil types during the first and second observation years. Turnover of fine root production and mortality was also affected by the two factors, elevated CO2 and different soil types. Median longevity of fine root increased under elevated CO2, especially in VA soil at the beginning, and a shorter fine root lifespan appeared after 2 years of observation (2011–2012). These results suggest that elevated CO2 does not consistently stimulate fine root turnover, particularly during the plant seedlings stage, as it may depend on the costs and benefits of constructing and retaining roots. Therefore, despite the other uncontrollable environment factors, carbon sequestration to the root system may be varied by CO2 treatment period, soil type and plant age. Communicated by T. Koike and K. Noguchi. We thank Mr. Ito Hirotaka for his contribution of the installation of the Mini-rhizotron system. We also thank Prof. Heljä-Sisko Helmisaari and Dr. Jaana Leppälammi-Kujansuu for their guidance on data analysis. Thanks are also given to Dr. Anthony Garrett of SCITEXT of Cambridge, UK and Ms. Amelie Vanderstock of Biological Institute of The University of Sydney, Australia for English improvement. This study was supported by the Japan Society for the Promotion of Science New field and Type B program (to T. Koike, 21114008 and 26660119). We declare that our research has no conflict of interest.